Siren’s Desire is the third and apparently final book in Devyn Quinn’s Dark Tides series. While it told the love story of Addison, youngest of the three Lonkie sisters, and gave us the final showdown with the evil Queen Magaera, it didn’t feel like “the end” to me. I wouldn’t be surprised if Quinn goes forward with the storyline under the umbrella of new series. She has introduced a new breed of sea shape-shifters and the future of “Mer” must be managed as they are introduced into the current century. I liked main character Addison Lonkie. She’s a tough, independent emergency medical tech (EMT) who just happens to be, like her older sisters Gwen (Siren’s Surrender) and Tessa (Siren’s Call), a mermaid. When she gets recruited by the Navy to serve as an advisor on a special unit to hopefully save the world from going to war with the Mer population, I was ready for some action. Unfortunately, there was very little…of any kind. The set-up of getting Addison on board and in position with the Navy and catching the reader up with her sisters, takes most of the book. Addison is attracted to Naval Captain Mason McKenzie and he is attracted to her. They have a single, brief, hot intimacy in the first third of the book and it’s all just angst and longing after that. When confrontation with Queen Magaera finally happens, it is equally brief and explosive. The final confrontation takes less than fifteen pages, ending a little abruptly for my taste. I could have done with one more chapter, even an epilogue. Some of my misgivings at what the book failed to be for me were mitigated in its overall feeling. 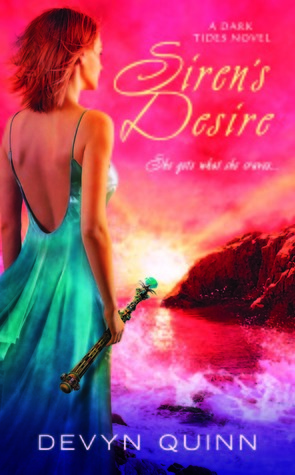 Siren’s Desire feels not so much like a contemporary romance as it does like a fairytale. The evil queen is one-dimensional crazy—easy to hate without remorse; the hero is a strong military man and loner who will only be tamed by his one true love; the princess is literally a princess—next in line for the throne as descendant from the last true queen. Add in some mermaids, sparkles, and a happily ever after and you’ve got a grown-up Disney movie. That’s not an insult. It just means that the book is more charming than the paranormal adventure I was expecting and that’s okay. I liked it. There isn’t a major deluge of mer-tales out at this time. I’ve mainly heard a lot of buzz for Tangled Tides. I can’t wait to read it and this series seems like an interesting one to check out.